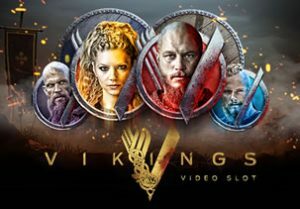 Based on the hugely popular television show of the same name, Vikings is a 5 reel, 243 ways to win slot game from Net Entertainment. This cracking looking games comes with a good range of extras. Hotspots can create plenty of transforming symbols while the Shield Wall creates matching symbols. Trigger the Raid Spins feature and you’ll play on an expanded game engine that offers 7 reels and 78,125 ways to win! Play on all devices from between 20p and £100 per spin. You can usually rely on a Net Entertainment TV adaptation to be well designed and that’s definitely the case here. Set against a misty mountain backdrop, the reels include metal A to 10 royal values as well as a quartet of characters from the show (Floki, Bjorn, Lagertha & Ragnar). It all looks suitably menacing. Vikings comes with 3 bonus features. Hotspot feature - if you’re lucky enough to land a fully stacked Viking character symbol on a Hotspot (reel 3), all the other Viking symbols on the reels on that spin will transform into the same matching symbol. A payout calculation is then made with all these new matching symbols paying scatter style. This can lead to wins of 243 times your stake overall. Shield Wall feature - on any spin, you could see a block of shield symbols cluster together to form a wall. These shields all then transform into the same matching mystery symbol and a new payout consideration is made. Raid Spins feature - land 3 Raid Spin scatters on the same spin to trigger this round. You’ll then receive 7 free Raid Spins. These are played out on an expanded 7 reel, 5 row machine that offers a mighty 78,125 ways to win. The number of Hotspots in play increases from 1 in the base game to 3 in so you can expect to see plenty of transforming Viking symbols. With scatter pays, you can win 10,000 times your stake if you get 27 of the same Viking symbol on the reels! Vikings is another high spec TV adaptation from Net Entertainment. The design is just as glossy and top end as you’d expect from a high-profile tie-in. Net Entertainment hasn’t shirked on the gameplay though and there’s an impressive range of extras on offer here as well as plenty of innovation.That’s certainly true of the Raid Spins feature where the expanded reel set and multiple Hotspots can serve up plenty of action. If you’re a fan of the TV show, then Vikings is a must play. Even if you’ve never seen the source material, the classy design and quality extras make this slot game well worth investigating. I also recommend you try Planet of the Apes (from Net Entertainment) which is superb.